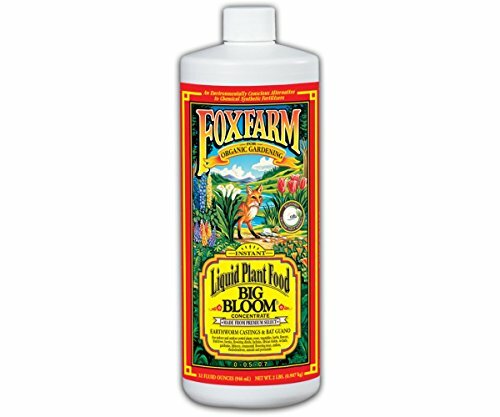 This article will be covering my review of the Fox Farm Liquid Nutrients Trio Soil Formula, an all-in-one solution for hydroponics growers everywhere. 1. You have a tough time measuring out individual nutrients to create your own ratio of nutrient solution. 2. You are not sure about the correct or balanced ratio for optimum plant growth in a hydroponics system. 3. You want to ensure that your plants will actually survive without resorting to too many adjustments (in terms of adding nutrients to the solution). 4. You want consistency in the way you farm your hydroponic plants. Fortunately, for you, the Fox Farm Liquid Nutrients Trio Soil Formula can be used for both conventional soil setups and hydroponics setups. So if you happen to have a traditional soil garden, you can use this liquid fertilizer trio to improve the yield of your soil garden. The system has three parts, and each part has its own function in getting a system off to a good start, and maintaining it. The manufacturer even offers a detailed feeding guide for plants, so you would know how to use the system immediately when it arrives in the mail. 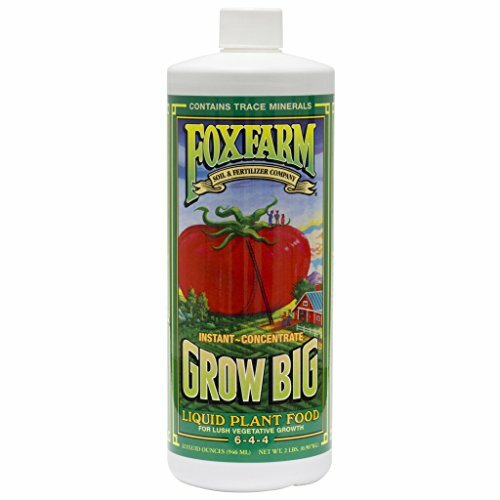 There are other products from Fox Farm that can boost the overall productivity of your hydroponics setup, but the most important components are already in the Fox Farm Liquid Nutrients Trio Soil Formula. 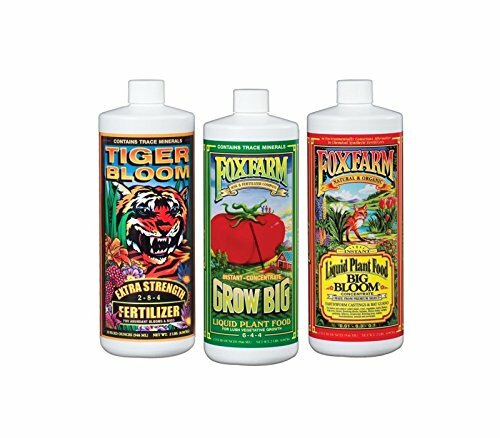 The trio is the groundwork, and in time if you want to see more vegetative action or if you need to super boost your crops, you can head over to Fox Farm’s other products. Big Bloom provides the groundwork for advanced nutrition and improved nutrient uptake of the plants. The specially formulated solution has been micro-brewed to ensure the highest organic grade fit for both hydroponic and conventional soil gardening setups. This formula includes guano (bat waste), castings (earthworm waste), and Norwegian kelp. Also includes adequate amounts of rock phosphate. Each of the main ingredients that comprise the entire Big Bloom solution has a specific function. For example, guano and castings are naturally rich in organic nutrients and trace elements necessary for expedited vegetative growth. Norwegian kelp on the other hand, will help your plants absorb the nutrients. Because it is not just enough to add the nutrients to the water, we have to boost the nutrient uptake capability of the plants as well. And finally there is rock phosphate. Rock phosphate improves the nutrient and energy transport capability of your plants, and this increases the capability of plants to bloom and grow. Grow Big is the trio’s young plant saver. We have all been there: we have successfully germinated the seeds into seemingly viable plugs, and then something happens in their environment and they begin to die off. It is painful to watch, as well as economically unfeasible if the die-offs keep happening under your watch. Using Grow Big will minimize and eventually eradicate instances when growing plugs suddenly die off. In short, this formula will help carry your plants from infancy to their teenage years. To apply, simply allow the new seedlings to acclimatize to their new environment for a few days, and then apply two teaspoons of Grow Big to the system. Tiger Bloom is the flowering master of the trio, and is applied after the first few weeks into the growing season. 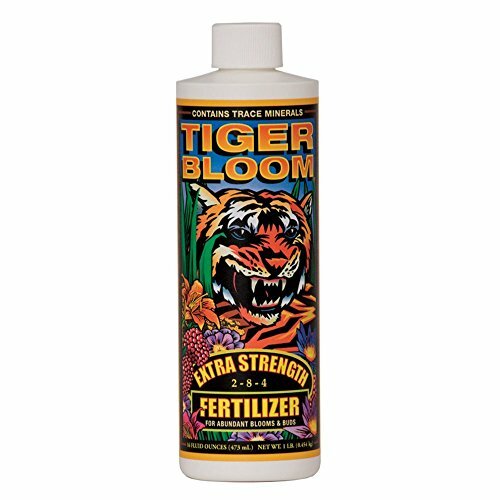 Tiger Bloom is fast acting, provides high levels of nutrients, and contains sufficient levels of phosphorous and nitrogen for healthy flowering of all kinds of plants. Nitrogen specifically, is much needed by plants and is consumed almost immediately once applied to the water. You need to keep giving your plants sufficient nitrogen if you want your plants to grow without any signs of stunting, as a result of nitrogen deficiency. What happens when you successfully apply Tiger Bloom to your crops in a standard twelve-week growing cycle? You will have an abundant supply of fruits and flowers, and any flowers will have much higher essentials oils output, too. 1. During the seedlings and cuttings period, turn on the light for 18 hours per day, and apply 2 teaspoons of Big Bloom and 1 teaspoon of Grow Big. EC range should be 0.7-0.9 and the PPM range should be 490-360. 2. From weeks 1 to 6 in the main growing period, apply 3 teaspoons of big Bloom and 2 teaspoons of Grow Big, with the exception of weeks five and six. In week five, apply only one teaspoon of Grow Big, and skip it altogether in week six. The EC range should be 1.2-1.4 in the first week, gradually increasing to 2.0-2.2 in the fourth week, and dipping down once again to 1.6-1.8 in the final five to six weeks. PPM range is 840-980 in the first week, rising to 1,400-1,540 in the fourth week, and decreasing to 1,120-1260 in the fifth and sixth weeks. 1. From weeks 7-8, apply 3 teaspoons of Big Bloom, 2 teaspoons Grow Big, and one teaspoon of Tiger Bloom in week 8. Keep the EC range to 1.8-2.0, 2.1-2.3, and PPM range to 1260-1400 in the seventh week, and 1470-1610 in week 8. 2. From weeks 9-12, increase dosing as follows: 4 teaspoons of Big Bloom, 2 teaspoons of Grow Brig, and one teaspoon of Tiger Bloom. The EC range should be 2.1-2.3 and the PPM range would be an average 1470-1610 toward the end of the growing cycle. 1. Repeat week 4 for an extended vegetative cycle. 2. Repeat week 12 for an extended flowering cycle. 3. Repeat week 12 formula if you wish to extend the overall growing cycle.